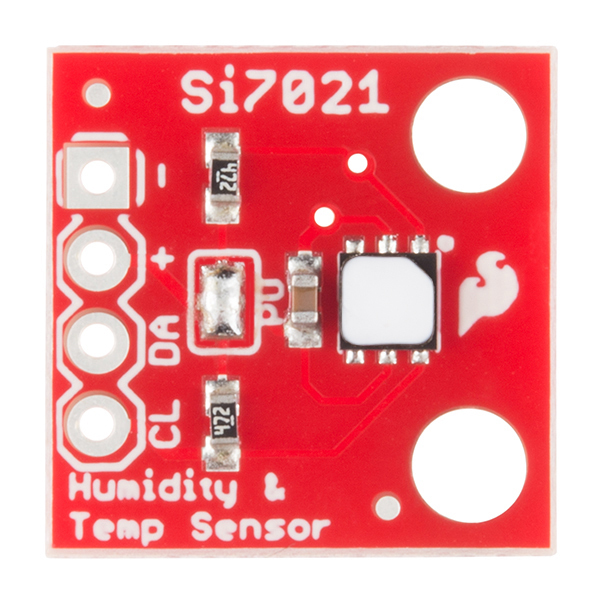 The Si7021 is a low-cost, easy to use, highly accurate, digital temperature and humidity sensor. All you need is two lines for I2C communication, and you’ll have relative humidity readings and accurate temperature readings as well! 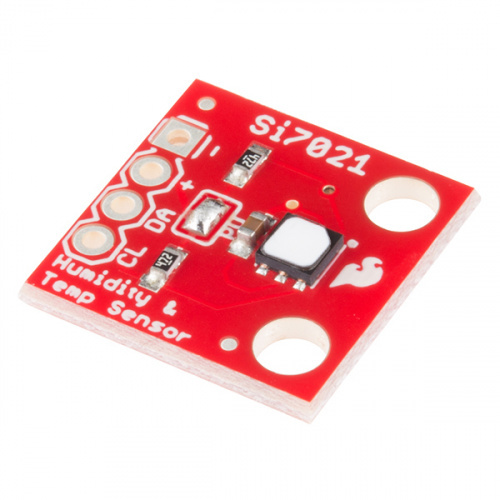 This sensor is ideal for environmental sensing and data logging, perfect for a weather station or humidor control system. The Si7021 also comes equipped with a hydrophobic PTFE filter covering the inlet on the sensor. This filter blocks contaminants but allows water vapor to pass through, keeping your sensor safe from water damage while still proving accurate sensor readings. Let's go over the Si7021 Breakout in detail. This breakout board has built-in 4.7K&ohm; pull up resistors for I2C communications. If you're hooking up multiple I2C devices on the same bus, you may want to disable/enable the pull-up resistors for one or more boards. On the Si7021, the pull-ups are enabled by default. To disable them, simply use some solder wick to remove the solder on the jumper labeled PU. This will disconnect the resistors from VCC and from the I2C bus. The tiny white cover on the IC is known as a Polytetrafluorethylene (PTFE) Membrane Filter. It keeps moisture out but allows humidity in. This filter is very low-profile, hydrophobic and oleophobic, and excludes particulates down to 0.35 microns in size. Heads up! Do not remove this white filter, mistaking it for some IC tape that was left on by mistake. Removing the filter may result in a shortened life span of the device or failure in highly humid areas. "Because the sensor operates on the principal of measuring a change in capacitance, any changes to the dielectric constant of the polymer film will be detected as a change in relative humidity. Therefore, it is important to minimize the probability of contaminants coming into contact with the sensor. Dust and other particles as well as liquids can affect the RH reading." Wiring up the Si7021 is very easy! We recommend soldering four male headers to the breakout board. You can also solder wires if your application needs. This board runs at 3.3V. Be sure to power the board from the 3.3V pin! Because I2C is an open drain signal, there's no need to worry about level shifting the signal; the 3.3V signal will be adequate to communicate with the Arduino and the signal will never reach a dangerous level for the pins on the Si7021. 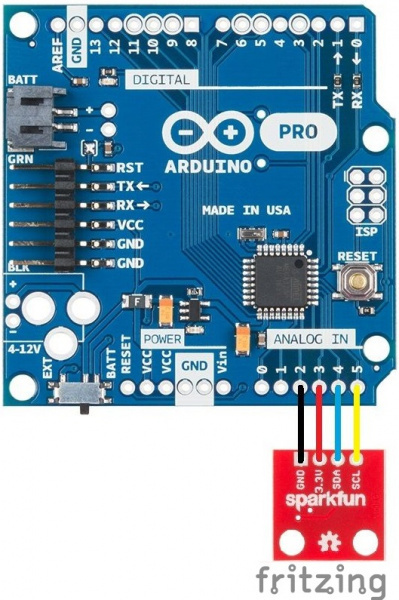 There are two ways to connect an Si7021 to an Arduino. The first is using pins A4 and A5 on classic Arduino boards. This breakout was designed using our standard I2C pinout, allowing the sensor to be connected directly to an Arduino without using a breadboard or wires. Heads up! This method will only work with Arduino boards that run at 3.3V such as the 3.3V Arduino Pro, the 3.3V Arduino Pro Mini, the SparkFun SAMD21 Mini Breakout and the SparkFun SAMD21 Dev Breakout. Also, if using this wiring scheme, be sure to assign pins A2 and A3 as GND and VCC, respectively, in your code. If you need to use this device with a 5V microcontoller, you will need to use a Logic Level Converter. This method is for those with newer model Arduino boards that have the SDA and SCL lines broken out. We'll be hooking up VCC and GND to the normal power pins and two data lines for I2C communication. Connect the SDA and SCL lines directly to the SDA and SCL lines broken out on the Arduino headers. To get started, use the example code and library files below. If you have not previously installed an Arduino library, please check out our installation guide. You can download the library from the link below. Check out our Installing an Arduino Library tutorial for more help. Once the library is installed, open Arduino, and expand the examples menu. You should see the Si7021 example. 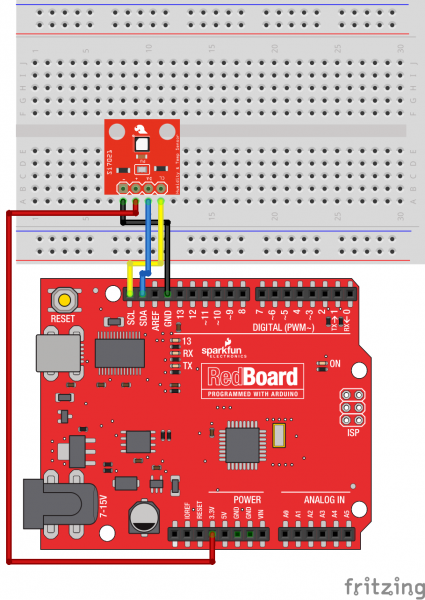 This sketch prints the temperature and humidity the Serial port. please buy us a round! Once you've uploaded the code, connect using this serial terminal to see the output. Weather::getRH() - Returns current Relative Humidity measurement. Weather::readTemp() - Returns temperature in Celsius from previous RH measurement. Weather::getTemp() - Returns current temp in Celsius. Weather::readTempF() - Returns temperature in Fahrenheit from previous RH measurement. Weather::getTempF() - Returns current temp in Fahrenheit. Weather::changeResolution() - Allows the user to change the humidity and temperature resolution. The vast majority of users do not need to change the resolution. By default the sensor will be in its highest resolution settings. This function is useful if you need to decrease the amount of time between readings or to save power. See the datasheet for more information. As an example, to change the resolution to 11 bit RH and 11 bit temperature, you would call myHumidity.SetResolution(0b10000001); to set bit 7 and bit 0. Resolution table can be found on page 25 of the datasheet. With that, you should now have a functional humidity and temperature sensing system. Check the links below for more information. Make an automated terrarium that manages heat and humidity levels. Build a humidor control box that maintains a constant humidity in a controlled space. Instructions on hooking up to and communicating with the Si4707 Weather Band Radio Breakout using an Arduino. Or check out this blog post for ideas.